Being born and bred a proud Norfolk girl, it irks me somewhat to find myself increasingly drawn to the beauty of the Suffolk countryside. There is no secret that the North Folk and South Folk of the eastern counties have a longstanding and somewhat misplaced rivalry about their lands; be it in the football teams they support, the coastline they inhabit or the beer they drink… there is no getting away from it; Norfolk think it’s better than Suffolk and Suffolk thinks it’s better than Norfolk. Personally, I am finding it increasingly difficult to declare which is which with such vehement confidence (I await my lashings). My real discovery of this was on a recent sojourn to the Suffolk coast (Dunwich to be specific). In the cold and quiet months of the agricultural calendar I managed to coerce my family away from the fertile fields of Hickling and away for an extended weekend to the Heritage coast of Suffolk for long walks, Southwold and a spot of history. Not brave enough to dare the tents in February we opted for a far more comfortable (and warm) abode for our stay; we booked into Jasmine Cottage in Dunwich through Cottage Holidays and looked forwardly to the break away. Arriving soon after work with a hassle free hour and half drive from Norwich I drove upto the welcoming white picket fence of a newly restored and renovated heathland cottage, complete with lead lined windows and uninterrupted views out across the marshes to Southwold; the intermittent welcoming flash of Southwold Lighthouse being a marker of civilisation in the distance. Quickly locating the local pub ‘The Ship @ Dunwich’ we were greeted by an outstandingly friendly and laid back welcome. Dogs of all shapes and sizes were welcome all over the bar and restaurant areas, children were greeted with laughs, smiles and child friendly menus (with more than just Scampi and chips on offer), this watering hole soon became our regular source of food and water throughout our stay. We filled our few days in Suffolk with walks along Dunwich Cliffs towards Sizewell, explorations through the Greyfriars Friary and Dunwich woods, with trips to both Southwold and Framlingham Castle, learning a little history along our way. Lying within Suffolk’s Coast and Heaths Area of Outstanding Natural Beauty (A.O.N.B), Dunwich was once a much larger town, with 6 churches serving its 3,000 strong congregation; it gained royal charter and 80 ships allotted to its register. The town prospered and was growing exponentially before mother nature delivered its first fatal blow in January 1328. A wind of hurricane strength hit the coast and caused the harbour to be blocked off, ships began to port in Walberswick and Dunwich gradually lost its importance. As the years progressed, weather increased its force on the Dunwich coastal shores, battering it with wind and tide. Today only a handful of houses remain, with one church standing rebuilt, inland. Along the cliff edge you can still find the last grave of All Saints, this was lost to the sea on 12 November 1919. Rather hauntingly and gruesomely the bones of those buried at All Saints’ have been found protruding from the cliff and some say in heavy seas the church bell can be heard to chime, under the waves. Reminders of man’s powerlessness against the forces of nature. Our second day was spent in Southwold (coldly) with a walk along the pier and promenade not long before a delicious lunch at The Crown and a spot of retail therapy at the Adnams shop on the highstreet (for those of you who are not aware, Southwold is home to the famous Adnams Brewery and Distillery), the smell of hops acted as a delicious aroma to our meanders through this pretty seaside town. On our third and final day we decided to head across (and down a bit) to Framlingham and have a cultural morning of Norman history amongst its Castle ramparts. Perfect for old and young alike, the tour throughout is informative and not too long. Lets not forget to mention beautiful too! Lovingly preserved and managed by English Heritage, the castle’s history begins in 1086 and remained within the hands of subsequent Dukes of Norfolk through treason, prosperity and treachery before becoming a poorhouse in the 1650’s and finally being handed over to the State in 1913. A real jewel in Suffolk’s crown, we all agreed we would visit again! 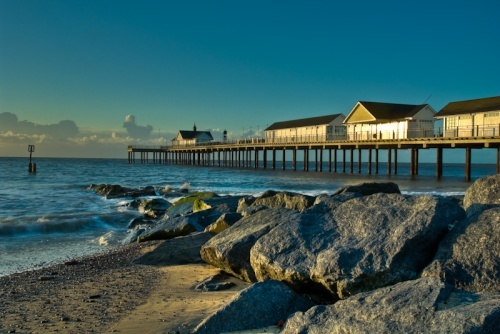 From Areas of Outstanding Natural Beauty (A.O.N.B) to bustling seaside towns rich in culture, diversity and national prominence to surprising landmarks rich in historical wealth and interest, Suffolk’s countryside seems to sit in perfect harmony with the people and businesses which exist within it. A unique and understated sense of class, culture and pride exudes from every corner of this pretty county. Like a wallflower Suffolk is silently stunning and I remain quietly guilty of my new found admiration for this place. . . Just don’t let Norfolk know!